VIKRAM MUTHANNA writes from Mysore: Recently, I was invited to be part of a group that is trying to raise funds for Pratham Mysore, the highly respected NGO that has helped improve the state of education in our country. Pratham Mysore has popularised the Balawadi pre-school programme where they pick a few volunteers in a community who are educated till class 10 and above and request them to educate the poor pre-schoolers in their areas. They also have many other programmes, the important one being the bridge programme in both rural and poor urban areas where they teach government school children after school hours. So far in Mysore, Pratham has successfully delivered education programmes to around 15,000 poor pre-school and primary students in Mysore and surrounding districts. So it turned out that they wanted my inputs and some publicity to raise some funds to create and support 212 new education centres in rural areas of Mysore. They already manage 182 such centres! After much discussion it was decided that just like how dinners are hosted to raise money for a cause in the west, we would try to have a gala dinner for which people would pay a premium as there would be some celebrities and in a cricket-crazy nation where cricketers are demigods, the chance of having dinner while hearing stories straight from the horses’ mouths—or shall we say demi-gods’ lips—would be a chance no cricket lover could pass up; especially when there are only 200 invites which would make the interaction more intimate. So, who would grace the gala that would attract some money? Ashvini Ranjan who heads Pratham Mysore and is also now the Mysore zone chairman of Karnataka state cricket association (KSCA), confirmed that our own City’s son Javagal Srinath (KSCA’s secretary) and son-in-law Anil Kumble (KSCA president) would participate. It was also thought that may be these two could also bring in Rahul Dravid with them, and a few more. 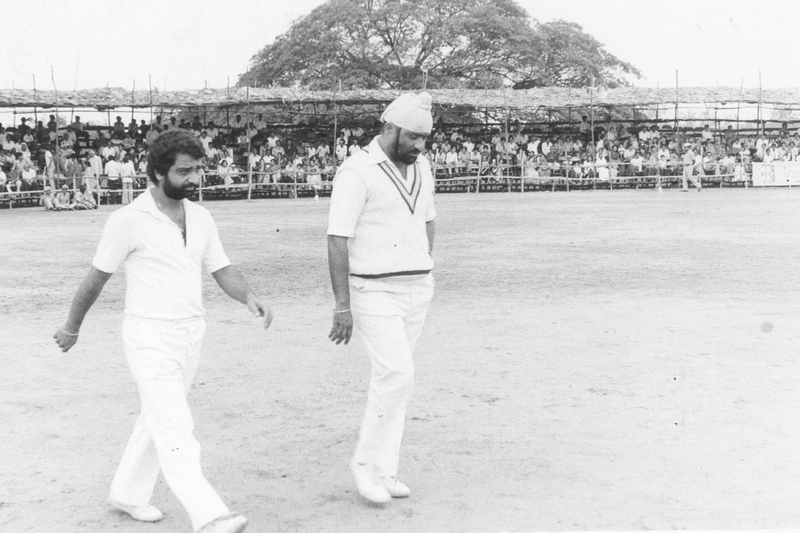 Just then, Ashvini Ranjan mentioned in passing how in 1981 they managed to convince a few top Indian national cricket team players to come to Mysore for an exhibition match to raise funds for a Lions school and how once the senior players were convinced, they in turn roped in other national players. This was impressive and I was curious. How did a group of smalltown men manage to get 16 members from the national team to our little City in 1981 for fund-raising ?! I pressed for more and the story I heard was worthy of a recount which held many lessons in celebrity-driven fund-raising and dedicated social service. 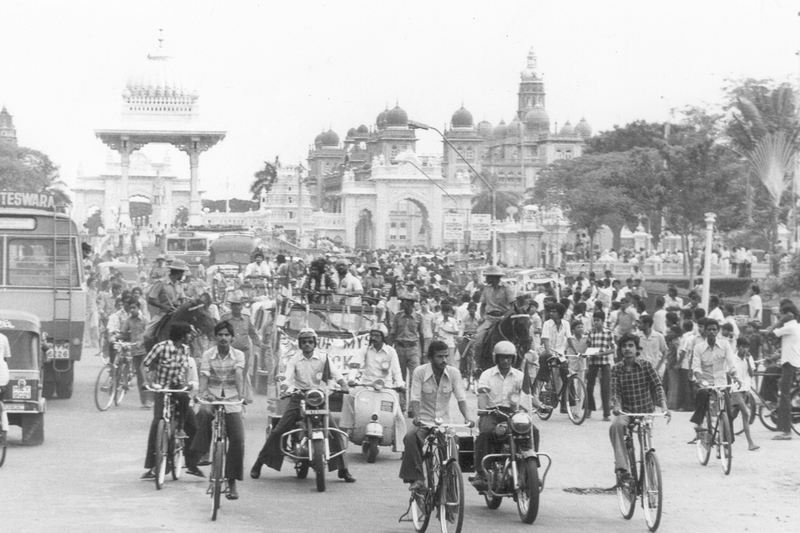 It seems, in 1981 the Lions Club of Mysore West wanted to build a school and had to raise some funds. The Club had many enthusiastic members and among them was R. Vasu, one of the partners of Cycle Brand Agarbathies who was very interested in cricket and well-networked in those circles. He came up with the idea of an exhibition cricket match between two teams each with a heavy mix of Indian national players! Yes, indeed, an audacious idea for that time, and even today. Soon he and the other Lions decided they would have two teams each with a mix of national players, State players and two local players. After many months of phone calls and umpteen visits to Bangalore, Vasu along with the other Lions managed to convince the core Indian players—then it was Dilip Vengsarkar, Sandeep Patil, G.R. Vishwanath, Brijesh Patel, Bishan Singh Bedi and Roger Binny. They, in turn, managed to convince others to come with them to play a day of cricket for a good cause. As soon as all the cricketers confirmed, air tickets were booked and it was communicated to them that a 42-seater luxury bus would be waiting for them at the Bangalore airport to bring them to Mysore. On the faithful day the bus left for Bangalore airport while the Lions Club members waited in front of Mysore Palace to give them a grand welcome. Late afternoon as the bus approached, the Lions members were excited and waited for the demi-gods to alight from the bus… but only Sandeep Patil and his girlfriend were on the bus! The members were soon informed by Patil that the others decided that they would come in private taxis and leisurely they started arriving one by one. Though the organisers were worried about the taxi expenses they were relieved that the players had arrived. The players were put up at the luxurious Rajendra Vilas Imperial Palace hotel atop the hill. 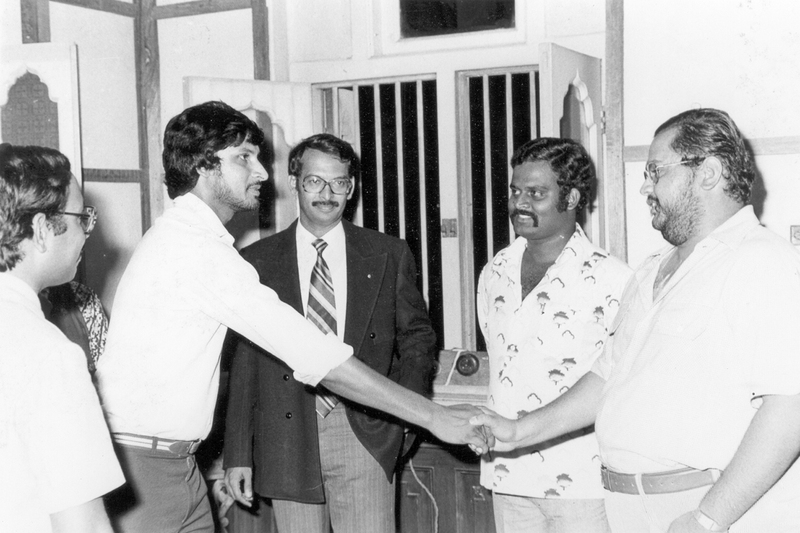 That night, they were felicitated at Lalitha Mahal Palace hotel with small elephant statues after which they left for their round of beers. Next day, they were taken on a procession around the City, which attracted huge crowds and generated so much publicity for the exhibition match that the next day all tickets were sold out, even though a ticket cost a princely sum of Rs. 100. 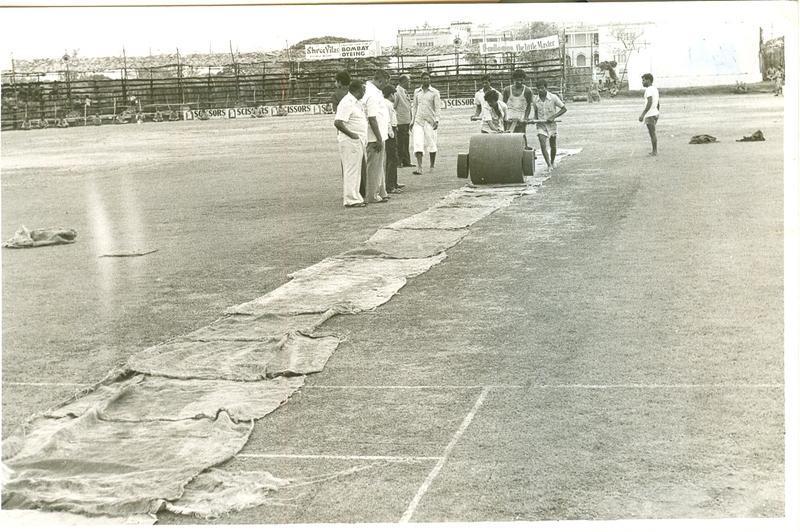 Also, since there was no cricket stadium with cover or seating, the members managed to have covered seating using coconut branches and bamboo for 15,000 people at Maharaja’s ground. No mean feat. With tickets sold out, passes given out to keep government officials happy, turf pitch ready, all seemed perfect for the match the next day. And then the unthinkable happened: That night it poured and poured. The next morning the pitch was soaked leaving the organisers with an unplayable drenched pitch. With the turf gone, match delayed and the 15,000 strong crowd growing restless by the minute, the organisers began their hunt for the only alternative — a cricket mat. Finally a mat was tracked down, and the person renting it knew the organisers’ predicament and charged them an arm and a leg. He charged them Rs. 3,500, a ransom in 1981. Soon the match was on and it poured again… this time it poured sixers from Sandeep Patil’s bat. Who won? Well, now no one quite remembers for sure. But they all remember that Sandeep Patil hit such huge sixers that they lost two cricket balls. As Ashvini Ranjan recalls, “We had so much fun that we never bothered about who won. Guess cricket won that day.” With that Mysoreans had witnessed legends in action. Mission accomplished… or so the organisers thought. Later, that night, the players were hosted for dinner at the Mysore Palace by Srikantadatta Narasimharaja Wodeyar, with live music. Players like Eknath Solkar sang and did a solo dance much to the delight of everyone present. The following day the players were to leave, but a handful of them stayed back. They supposedly said they loved the weather of the City and loved the location of their hotel atop the hill so much that they wanted to stay a few more days. But many organisers now say, the players seemed to have enjoyed their beer much, much more than the weather. In the end after a week of cricket drama, the Lions Club which had invited national players to raise funds for their ambitious school project had managed to collect Rs. 3.5 lakh by way of ticket sales and sponsorships. 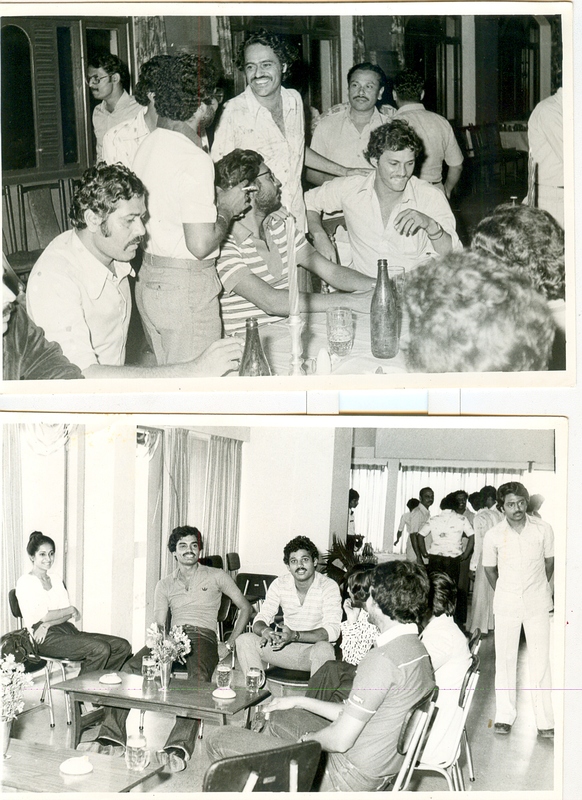 It seems by the time the cricketers had left and by the time the organisers had paid for their air ticket, the bus that brought just one couple, taxis, the mat, mementoes, beer, food and stay, the Lions Club was left with… just Rs. 18,000! The dream of a school was back to the pavilion. To add, the free passes they gave to the government officials had eaten into their fund-raising budget substantially. It seems the cricketers had left feeling high, while leaving the organisers completely dry. While the Lions members were left lost, the then divisional commissioner and CITB Chairman M.P. Prakash, who heard of the debacle, felt bad and offered the Club one-and-half acres of land in Gokulam for the school and told them that for the time being, they can pay the Rs. 18,000 as down payment and the rest they must pay on time in installments. The club members gladly agreed and today, Gokulam Lions School sits on a two-acre land with a student strength of 650. What 16 Indian cricketers could not do, an understanding, kind and good bureaucrat did. This shows the power bureaucrats have and the good they can do with it. Today, the 1981 batch of Lions West members laugh at how they lost all their money to the players’ extravaganza, but they still thank the cricketers for generating great publicity which later helped them raise funds to build the school. 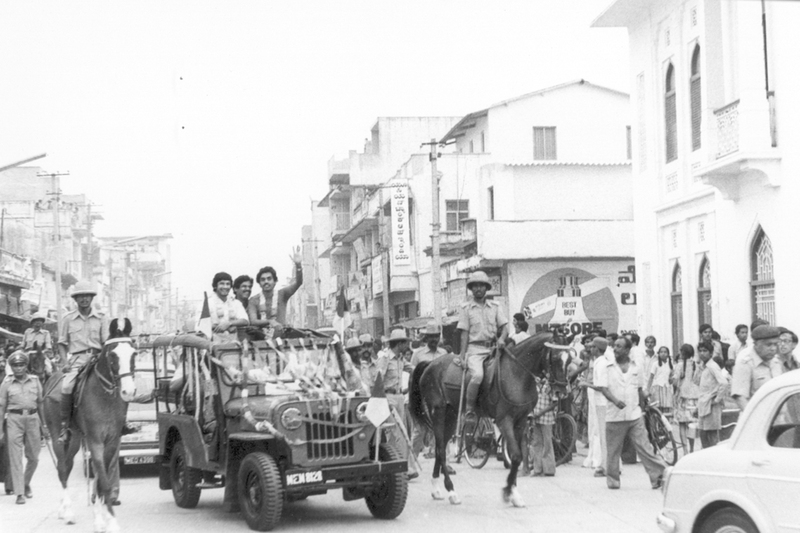 After I heard this story, I couldn’t help but ask if Ashvini Ranjan had any photographs of the event so our older readers could reminisce and younger readers could delight themselves. In fact even the photos of this event has a story. It seems the organisers were so disheartened after the event, that they forgot all about the photographs and six months later it arrived in a box at the then Lions Club President Ashvini Ranjan’s house who kept it safely and after a while started gifting it to people who were in the photographs as memorabilia on their birthday or special occasions. Yes, Ashwini Ranjan and the supporters of Pratham like myself, will once again try to rope in cricketers to raise money, publicity and good will for a good cause. This time, instead of cricket, it will be over good food. But we are also aware and take comfort in the fact that unlike yesterday’s cricketers who had time, for today’s cricketers time is money and they have no time to sit around enjoying beer and good weather. So there is no way Srinath, Kumble, Dravid and others will get high and leave us dry. The event has been scheduled for 7th of July 2013 and there are only 200 gala dinner tickets. The cost of the tickets will be announced in the coming weeks. This is a chance to meet, talk and ask whatever you want with the living cricket legends, or if you just like to donate you can contact Pratham through www.prathammysore.org or call Ph: 0821-2412612 or if you just want to have good food and good company you can sit at the table with yours truly and consume a bit of politics, a little bit of art and culture and a large dose of dirty jokes and a fair amount of happy spirit. This entry was posted in Cricket, Etcetera, Mysore-Bangalore, Once upon a time and tagged Anil Kumble, Bishen Singh Bedi, Brijesh Patel, Churumuri, Cycle Brand Agarbathies, Dilip Vengsarkar, Eknath Solkar, G.R. Vishwanath, G.R. 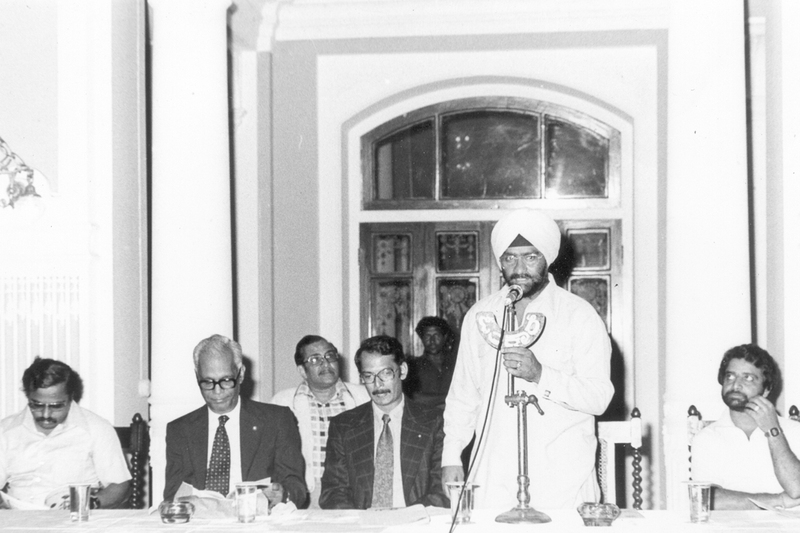 Viswanath, Javagal Srinath, Lalitha Mahal Palace Hotel, Pratham Mysore, R. Vasu, Rahul Dravid, Rajendra Vilas Imperial, Roger Binyy, Sandeep Patil, Sans Serif, Srikantadatta Narasimharaja Wodeyar, Star of Mysore, Vikram Muthanna. Bookmark the permalink. Thanks for sharing sir. A delightful post. It is hard to believe that all these things happened as recently as in 1981 (30 years may not be a long time!). And see the changes in these 32 years.! Today the cricketers are able to afford establishing a school by pooling money themselves. But will they do it? I doubt. By the way, what happened to the school? Nice article. I actually shared this on Twitter and put in Mr. Bedi’s handle twitter.com/BishanBedi with the tweet. He saw the post and wrote back saying they revived many memories. I remember this one very well.My Dad was very active in the Lions club at that time. I was 12 years old and very disappointed that I could not attend as I was in boarding school. 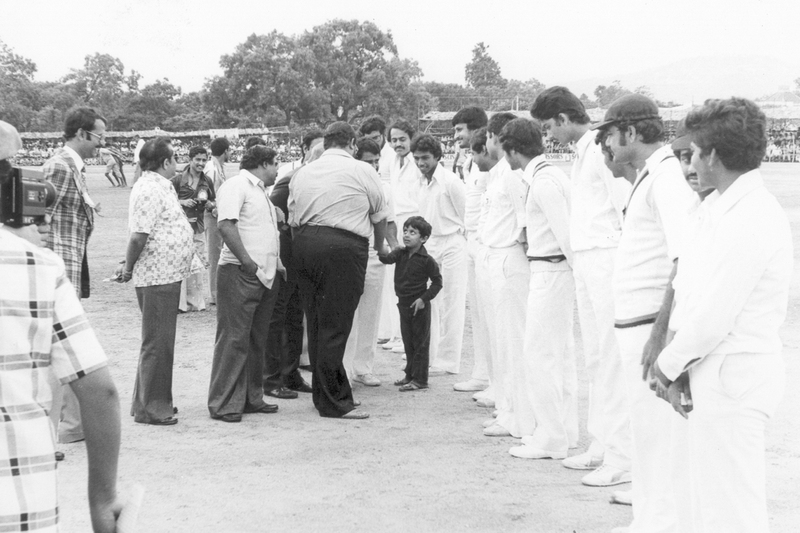 I thought this was after India won the World Cup in1983 .Kirthi Azad was yet to come off age in1981 .